Kal, could you tell us more about your role at Cameron LNG? Currently, I serve as Director of HSSE, for Cameron LNG. I’m accountable for developing and implementing an overarching corporate and operational HSE management system that includes operational excellence and risk management. I maintain the strategic security infrastructure to meet our MARSEC and US Coast Guard requirements. Alongside leadership I create and maintain a safety culture reflected in our commitment to an injury-free and accident-free workplace. Luckily I have zero recordable incidents in the last threeyearswhich is both a blessing and a curse. Would you say the industry has come a long way in terms of HSSE, since you started 36 years ago? I think that’s a fair statement. Many of the tools that we use now were not available, but equally, in the past we were really addressing the personal injury incidents which were occurring in the refineries and in the workplace. We did a great job reducing those personal injury incidents, whether it be illness or injury. Yet we were not focusing on process safety, so the bigger, low-frequency, high-severity type events were not on our radar. In turn, we had a number of significant events leading up to Macondo that were associated with that process safety element. 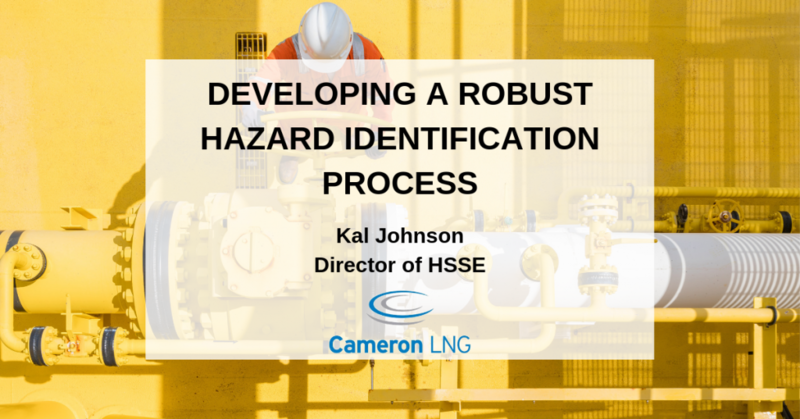 How does Cameron LNG approach operational excellence? We don’t call our process operational excellence, we call it the Cameron Enterprise Management System, it has 12 elements which when implemented will create operational excellence. Operational excellence is not the end objective, it is about the various processes put in place that demonstrate operational excellence. One of the keys that I have found to be important on this journey, is listening to the low-frequency inputs. Hidden behind the outspoken group of employees is a quieter group of people, and unless leadership makes it a priority to include them in the conversation, so many issues and hazards can be missed. Could you tell us a little bit more about the hazard identification and control process in risk management program?